A relatively staid hearing became interesting toward the end when some of the lawmakers said Zuckerberg did not answer their questions. Facebook CEO Mark Zuckerberg had mostly avoided the toughest questions posed by European lawmakers on Tuesday — until he tried to wrap things up. That's when things got a little contentious. "I asked you six yes or no questions. I got not a single answer," one of the lawmakers said after Zuckerberg tried to end the hearing. "And of course, well, you asked for this format for a reason." Zuckerberg paused before answering: "I'll make sure we follow up and get you answers to those." 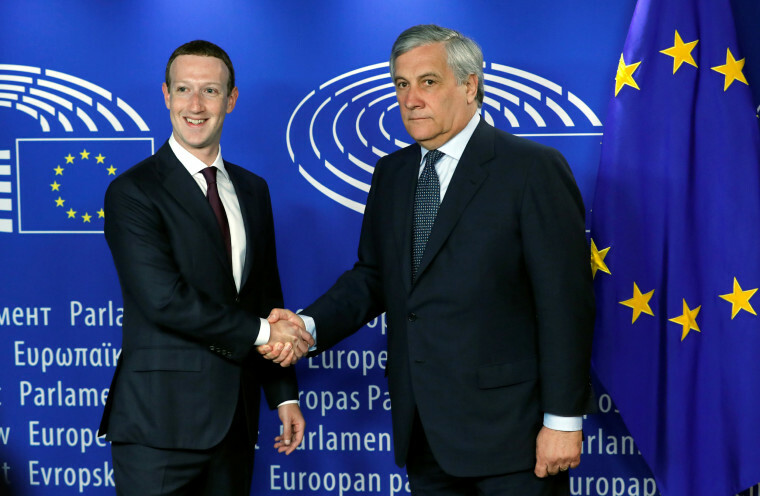 Zuckerberg’s first appearance before European lawmakers in Brussels on Tuesday started slow but became contentious as the Facebook CEO parried suggestions that the company was a social media monopoly and lawmakers expressed annoyance that he was not offering assurances about the company’s ability to protect users’ privacy data. The format featured the E.U. lawmakers taking turns asking questions, with Zuckerberg then addressing those questions all at once. While some of the politicians asked pointed questions, Zuckerberg mostly avoided them. When pressed toward the end about shadow profiles — in which Facebook builds profiles of nonusers based on their web activity — Zuckerberg gave a short answer about using them for security purposes and quickly moved on. Europe has been more aggressive than the United States in rolling out new tech regulations and questioning the power of monopolies, and many of the lawmakers on Tuesday were eager to hear Zuckerberg address their concerns about the proliferation of fake news and Facebook’s data harvesting scandal. "We exist in a very competitive space where people use a lot of different tools for communication, where the average person uses eight different tools for communication,” Zuckerberg told lawmakers. “From where I sit, it feels like there are new competitors coming up every day,” he said. Facebook is “constantly needing to evolve our service,” he said, but stopped short of directly addressing the question of whether Facebook, Instagram and WhatsApp need to be broken up, despite being pressed again at the end for a more definitive answer. Zuckerberg’s testimony comes as the European Union is preparing for a sweeping data privacy law, known as GDPR, that is scheduled to go into effect this week. The regulations give Europeans ownership of their data and require companies to report breaches within 72 hours. Failure to comply can result in a fine as high as 4 percent of a company’s annual revenue, which for Facebook would be billions of dollars. Zuckerberg did not address a question from Guy Verhofstadt, a member of the European Parliament from Belgium, who asked if Facebook was prepared to compensate users whose data was misused, one of the remedies afforded to users under the upcoming GDPR regulation. Verhofstadt said that could mean as much as $150 for every user. #Zuckerberg | Art. 82 of #GDPR states that any person who has suffered damage shall have the right to compensation. When will you compensate Facebook users whose data has been misused? Given that the data in a Facebook profile can be worth up to 150$, how much will they receive? Instead, most of Zuckerberg's comments pointed to a bevy of recent announcements that the company has made in the aftermath of the fake news and Cambridge Analytica scandals, including the use of artificial intelligence to proactively detect fake profiles, hiring more moderators, and a initiativing a company-wide review of apps that users connect to through Facebook. Connected apps have been a particularly sensitive topic since it was found that a Cambridge University researcher had used a quiz to collect the Facebook data of 87 million people — data that was then allegedly used by the data analysis firm, which worked with President Donald Trump’s election campaign. “I do anticipate there are other apps we are going to find and want to take down,” Zuckerberg told lawmakers. Zuckerberg also touted strides the company has made in stopping the spread of misinformation. He pointed to the 30,000 fake accounts that he said were removed from the social network before the French election. He also said Facebook worked to “proactively detect and remove accounts from Macedonia” that appeared to spread misinformation during the U.S. Senate special election in Alabama in December. Zuckerberg is also facing growing pressure from lawmakers in the United Kingdom to come to London to answer their questions. In March, the U.K.’s information and data privacy regulator launched an investigation into whether Facebook safeguarded personal information and whether it acted "robustly" when it learned about the loss of the data. After several hearings with other Facebook executives, Damian Collins, chairman of the Digital, Culture, Media and Sport Committee in the United Kingdom, has deemed their answers unsatisfactory and has asked for Zuckerberg to testify. Following his session in Brussels, Zuckerberg is expected to meet with French President Emmanuel Macron on Wednesday. Yuliya Talmazan and Reuters contributed.